When Hannah first contacted me on behalf of Kona Blue asking if I was interested in trying Kona Blue's Kampachi, it seemed too good to be true. I'm not used to getting asked to do reviews so I didn't know what to do. Then I saw a steamy review so I asked Jaden what she thought. Basically it's great fish, a great company, and no strings attached. I love sushi so much, how can I turn down sushi grade fish?! Hannah was also suuuuper nice and answered all of my questions! Thanks Hannah! Kona Blue was founded in 2001 by two marine biologists who wanted to create sustainably raised, sushi-grade fish. I used to think that farmed fish, like farmed salmon, are inferior in both taste and nutrition to their wild counterpart. However, Kona Blue Kampachi is premium quality fish that's high in healthy omega-3 fatty acids and has no detectable levels of PCBs or mercury (a concern with fish like tuna). Kampachi is native to the waters of Hawaii and is better known as amberjack or kalaha. It's a relative of the Japanese hamachi or yellowtail (not yellowfin, which is a tuna). In the wild, kalaha is particularly susceptible to a toxin that causes serious food poisoning, but through aquaculture and by controlling what the fish eat, kampachi can now be raised sustainably and safely for consumption. The fish are raised in high tech pens suspended in the ocean, fed food made from fish meal and oil from sustainable fisheries and organic wheat, and they are not given any antibiotics or medications. And to top it off, Kona Kampachi has an even higher fat content than wild kalaha, a whopping 30% fat. When you buy directly from Kona Blue, the fish is shipped overnight to you. I was so excited on the day my fish was to arrive, I kept looking outside the window scanning the streets for the Fedex truck. Inside the package, were 2 very large fillets sitting happily on plenty of ice packs. I've never had so much sushi grade fish in my house, it made me absolutely giddy. The first thing I did was I checked the fish for freshness and gave the fillets a big whiff. There was no fishy smell whatsoever, a good sign. It was pretty much odorless with a slight hint of ocean. I bet you're rolling your eyes thinking "Pssshh smells like ocean, what BS." But it's true, the fish was incredibly fresh! The flesh was firm and shiny, another good sign. I rinsed off each fillet and then removed the bloodline, the dark purply, red flesh on the skin side of the fillets. The bloodline usually tastes too strong, fishy, and just plain funky. It's best to keep fish as whole as possible until you're about to cook or serve it, and break it down into pieces no more than a day in advanced (I broke this rule and had some pieces I cut up 2 days in advance but it was still really fresh 2 days later). The first thing I wanted to do with the fish was a dinner of sashimi and nigiri. It was so glorious, I couldn't bear to cook it. I reserved 2 large portions for searing the next day. The smaller pieces I used for ceviche and poke, a tribute to this Hawaiian fish. Finally there were 2 pieces of really fatty belly that were too thin for sashimi so I opted to sear these simply with salt and eat with rice for a simple lunch. Now here's my Martha moment: Sustainably raised sushi grade fish? It's a good thing. 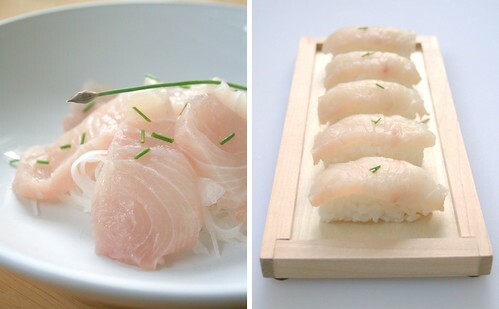 Make a mountain of shredded daikon, put some shiso leaves on top, and lay slices of fish on the daikon. The piece of sashimi or fish that goes on top of rice for nigiri should be about 2 fingers wide and 4 fingers across (something I read in the The Zen of Fish but it will vary with the size of your fingers). As for the thickness, that's up to you, but I like a decently thick piece of fish. There was a whole page in The Zen of Fish dedicated to how a sushi master forms the nigiri rice. The mark of a sushi master is how light and loose the mound of rice is and how most of the rice grains face the same direction. I am no sushi master and the rice grains in my rice mounds definitely don't all face the same direction. But the most important part is to keep your hands slightly wet when forming so the rice doesn't stick all over your hands. Wet your hands, let the excess drip off, and then clap them together to get rid of excess water. Use a gently touch to form the rice mound, don't pack the rice so tight it's like a solid pellet. I never thought I would be sick of raw fish, but after gorging ourselves the previous night, Steven and I yearned for a cooked recipe. The high fat content in the fish not only gives the fish a great mouthfeel when eaten raw but it keeps the fish super moist and delicious even in the high heat of searing. 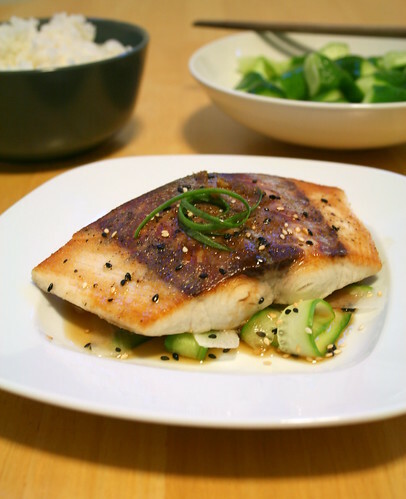 I served the seared kampachi on a bed of cucumber and daikon ribbons and ponzu sauce with rice and cucumber salad. Season the fish with salt and pepper. Heat 2 teaspoons of oil over medium high heat in a nonstick skillet. ADd the fish and sear until there is a nice golden brown crust on both sides of the fish, 3 - 5 minutes per side. Drizzle with ponzu sauce and garnish with toasted sesame seeds (optional). Cucumber ribbons: you can use a mandoline but if you don't have one (like me), hold the cucumber flat on a cutting board and use a vegetable peeler and run it across the length of the cucumber to get a thin strip of even thickness. This works best with baby cucumbers or english cucumbers. Discard the first strip since that one is just skin. Then the next day I tried two more recipes, one raw and one "cooked". I made a poke, a Hawaiian fish salad appetizer made with raw fish and a variety of other condiments, and ceviche, another type of fish "salad" where the fish is "cooked" in citrus juice. The acid in the juice denatures the proteins in the fish and slowly turns the fish from translucent to opaque, essentially cooking the fish. 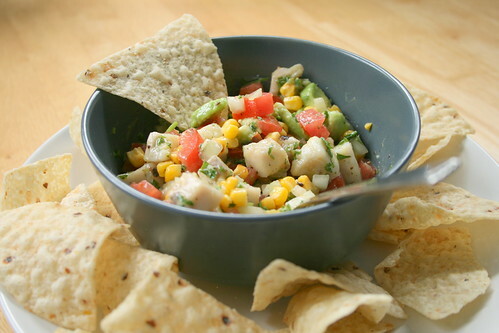 I couldn't believe how easy it was to make ceviche. The mango added a really nice tropical sweetness and the toasted corn added a really light smokey flavor. Add the citrus juices to the fish in a nonreactive bowl. Cover and refridgerate for 3 - 6 hours, stir every hour. The longer the fish marinate in the juices, the more cooked it will be. Cut the tomatoes into a dice similar to the size of the fish and let it drain in a colander for 30 minutes. Heat an empty skillet (no oil) over high heat and add the corn. Cook, shaking the pan occasionally, until the corn has toasty brown spots, and is almost popping out of the pan. Set aside to cool. After the fish has cooked to your liking, drain it from the juices. 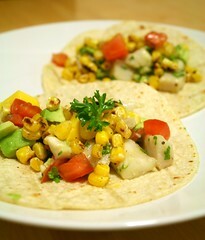 Add the chopped onions, tomatoes, avocado, mangoes, corn, parsley/cilantro, olive oil, and season with salt and pepper. Let it sit in the fridge for at least an hour for the flavors to meld. Serve with tortilla chips or on warm corn tortillas. As for the poke, it was mix this and that in and season to taste with soy sauce and sesame oil. I didn't have any fresh seaweed, which is what's traditionally used, so I used some thinly sliced nori. Mix the fish with the soy sauce and sesame oil. Let it marinate in the fridge for an hour. Start off light and season more later if needed. 30 minutes before serving, add the rest of the ingredients, season to taste, and chill before serving. Don't add the ingredients too earlier otherwise the nuts will get soggy. I've been seeing lots of posts about this fish, and I wonder... I never keep fish beyond the day I buy it, unless I freeze it to use for something else like chowder. did you keep it packed on ice, and did it stay very fresh? oooh! I had no idea you could order mail order sushi-grade fish like this! Oh my goodness. I am very excited, I've been wanting to make sushi for ages but I don't want to use the normal salmon. This looks really stunning. Wow, that fish looks amazing, I'll definitely have to find a way to get my hands on some! And you were so creative in making it so many different ways. Great job, great post. Thanks! We love Kampachi and get it from our Whole Foods. Expensive, yes. But worth it! I love the recipe for the Ceviche style fish tacos. I haven't tried Kampachi in a fish taco yet. I love all the great ways you prepared it too. Every single one of your recipes look amazing. wow, that takes talent to make! Looks so delicate and delicious! I am interested in the food culture of your country so that you are so. Lydia - I kept it in the fridge for 2/3 days and it stayed very fresh. But yes generally I don't keep fish too long. Helen - Mail ordering makes it super convenient but expensive. Jaden - :D Me too lol. Bettina - Yeah someone has to tell him that once in a while ;D.
WC - Aw thanks! Yeah I felt so lucky to be asked to try this. Lina - Aw thank you! What stunning presentations of such beautiful fish! ohhhh my gosh! the dishes look so good! it's only 8:30 in the morning and i am already craving sushi!!!!!! that's so awesome you can get order sushi-grade fish!! !